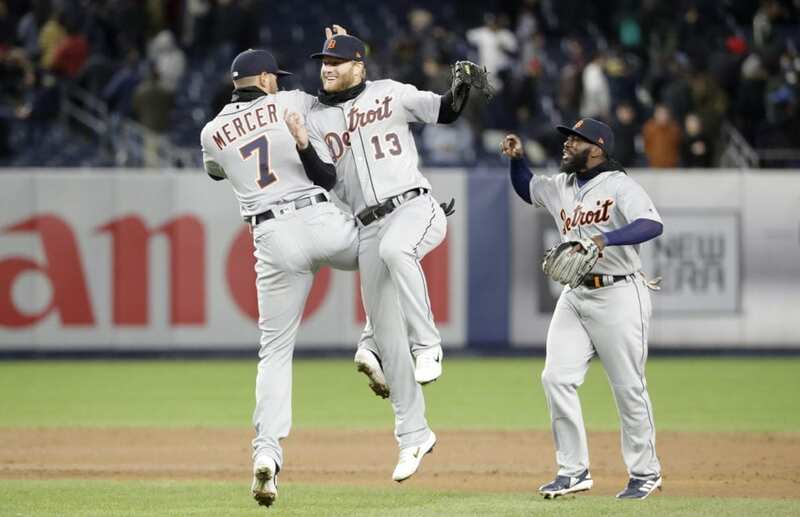 NEW YORK (AP) — Dustin Peterson laced a tiebreaking double off Aroldis Chapman in the ninth inning for his first major league hit, and the Detroit Tigers beat the New York Yankees 3-1 on a nippy Tuesday night. 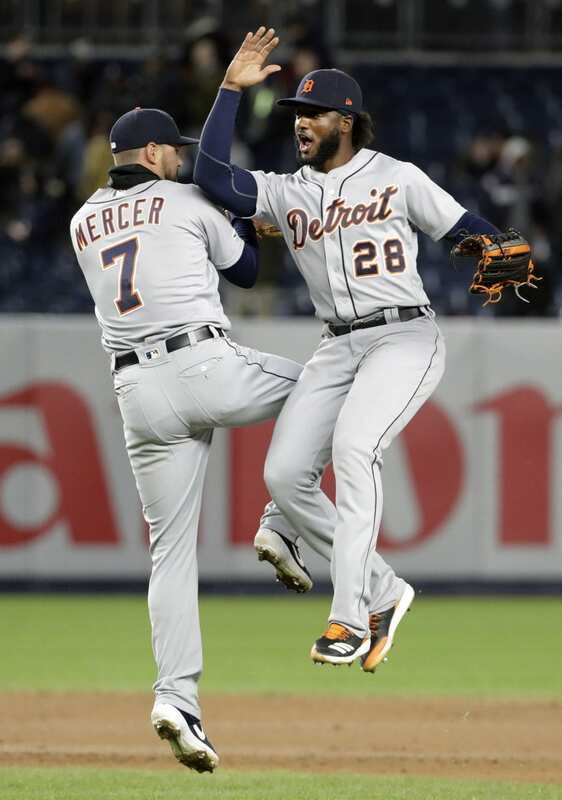 Jordy Mercer added an RBI single for insurance, and the Tigers got another strong start from Jordan Zimmermann after he carried a perfect game two outs into the seventh inning on opening day in Toronto last week. This time, Zimmermann held a makeshift Yankees lineup depleted by injuries to one run in 6 2/3 innings. Jeimer Candelario and John Hicks hit consecutive doubles off New York starter Masahiro Tanaka with two outs in the sixth to tie it 1-all. Candelario’s grounder caromed high off first base and past Luke Voit as the big first baseman tried in vain to grab the ball with his bare hand. Joe Jiménez (1-0) worked a hitless eighth and ended the inning with an unassisted double play after snagging Gleyber Torres’ line drive and jogging to first base himself. The 24-year-old Peterson was 0 for 9 in the big leagues before connecting on a 95 mph fastball. He clapped his hands and smiled at second base after collecting his first career RBI as well. 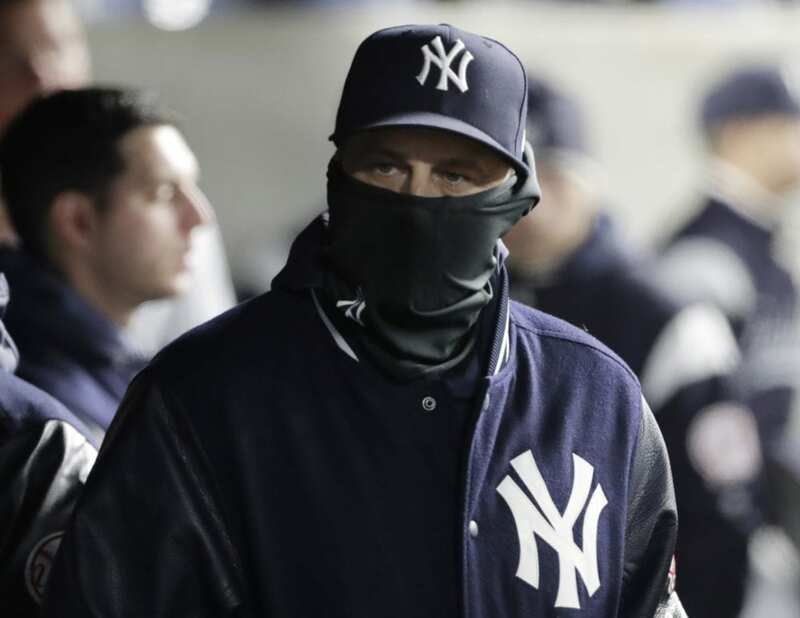 Zimmermann, who is from Wisconsin, pitched in short sleeves while other players bundled up on a 45-degree night in the Bronx. The right-hander struck out six and walked one. 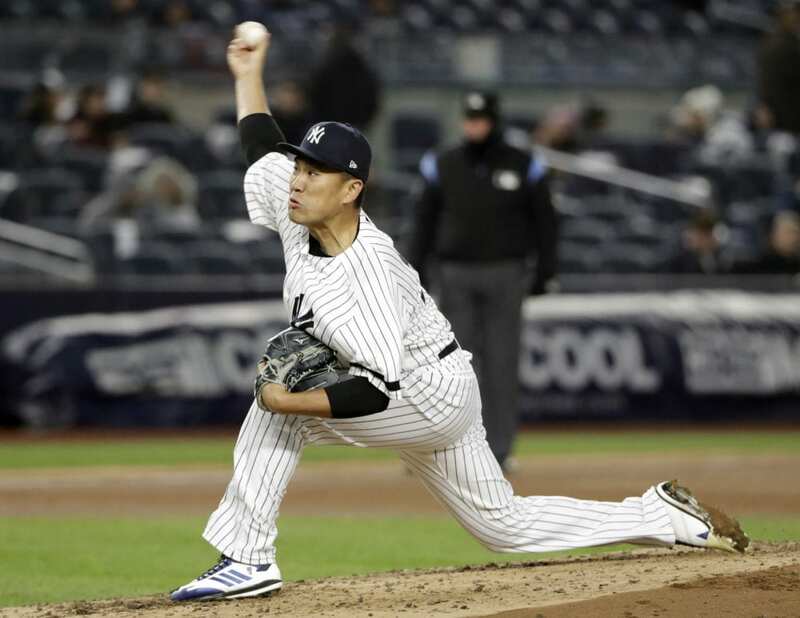 Tanaka also went 6 2/3 innings, allowing one run and eight hits with seven strikeouts and no walks as he pitched out of two early jams. Chapman lost for the first time since Aug. 25, 2017. Tigers: A sore calf kept Goodrum out of the starting lineup in the cold weather. 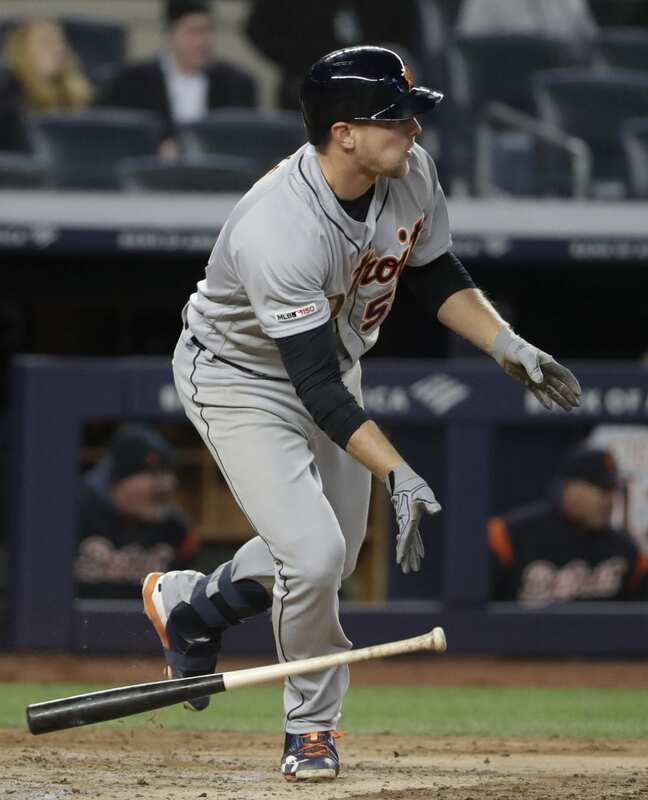 … OF JaCoby Jones (sprained left shoulder) is about ready to take batting practice but will need a minor league rehab assignment before he’s activated from the injured list, manager Ron Gardenhire said. 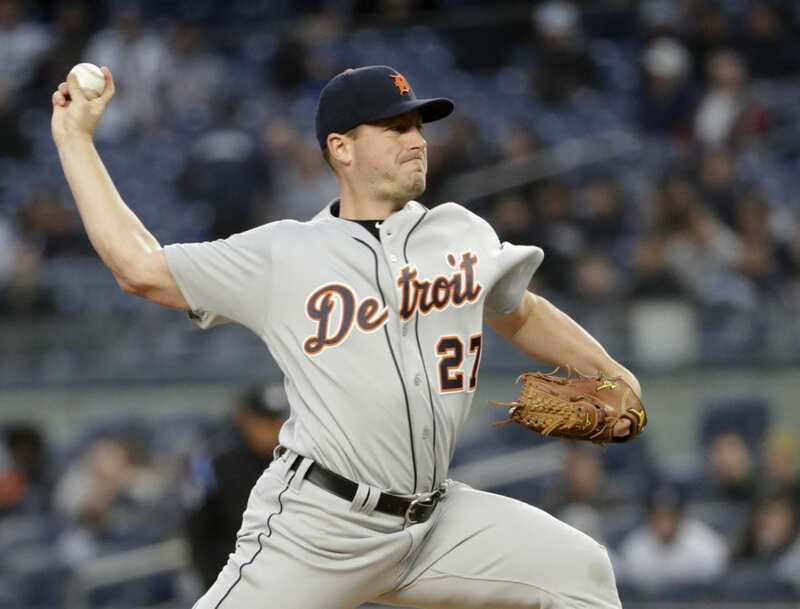 … RHP Drew VerHagen (right flexor pronator strain) has been throwing bullpens and is ready to throw batting practice but also will need a minor league rehab assignment before rejoining the Tigers, according to Gardenhire. Yankees: RHP Dellin Betances (right shoulder impingement) threw a bullpen that went well, manager Aaron Boone said. 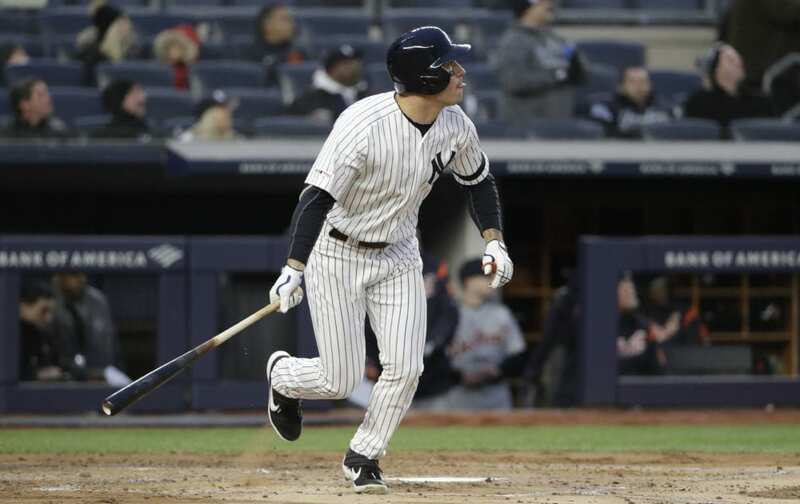 “He should be getting ready to face hitters and if that goes well, Dellin would be moved pretty quick,” Boone added. … C Gary Sánchez, SS Troy Tulowitzki and 1B Greg Bird were rested. Bird probably will start Wednesday against the left-hander, Boone said. … RHP Luis Severino (rotator cuff inflammation) is still long tossing but isn’t ready to work off a mound yet. … Voit was shaken up but stayed in the game after getting hit on the left hand by Jimenez’s 96 mph fastball in the eighth. Yankees: Rookie RHP Jonathan Loaisiga will be called up from Triple-A Scranton/Wilkes-Barre to start. The 24-year-old from Nicaragua was 2-0 with a 5.11 ERA in four starts and five relief appearances for New York last season. He had 33 strikeouts and 12 walks in 24 2/3 innings. Loaisiga went 2-1 with a 6.75 ERA and 18 strikeouts in 16 innings this spring training. Be the first to comment on "Peterson’s 1st MLB Hit In 9th Sends Tigers Past Yankees 3-1"